I believe that great spaces are lived in spaces. If you can’t see a wrinkle on a couch or bed, disheveled books on a coffee table or shelves filled with nick-knacks then it’s not a room to get cozy and comfortable in. I’ve looked through many magazines gazing at photos of amazing spaces. Sure they are beautiful and pristine but they are still missing particular elements which keep them from feeling comfortable. When you are home most of us want a space that welcomes you in and says, “stay awhile.” You want to be able to kick your heels off and relax on the couch or bed surrounded by the things you cherish and make you happy. 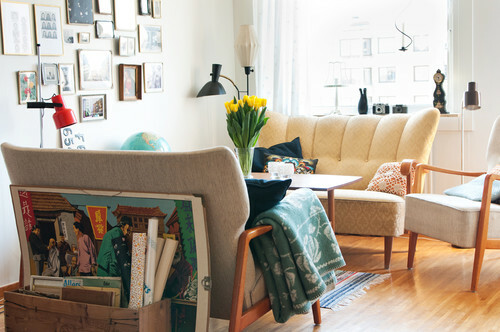 Here are five ways to make your living spaces homey and inviting without sacrificing on style. A relaxing bedroom starts with comforting items like pillows and great bedding. Natural lighting does create a solitary and peaceful environment. Every room needs a little “shadow play.” Whether you have natural light filtering through curtains, shutters or sheers, let the rays stream in. It adds such warmth to a space. If you don’t have sunlight to play with then try using tea lights, candles or light fixtures such as chandeliers. Having mirrors on the walls or reflective metals will help bounce light off and make a room more luminous and easy on the eyes, creating a relaxing environment. Ambiance can be created by using effects other than lighting. Think of the five senses; smell, taste, touch, hearing, and sight. The smell of fresh baked cookies or burn a candle that smells like like fresh baked cookies! How about some music? Nothing like some soothing sounds to relax the mind. Whether you play classical, jazz or a little Adele, you will enhance a rooms homeyness instantly and create a mood. The depth of a room is important in making it cozy and providing the mood factor as well. A room can sometimes seem flat and too one dimensional when furnishings are all you see – that’s where accessories, fabrics and unique textured walls come into play. Creating a relaxing more ambient space by adding throw pillows, rugs, and unique wall techniques are a great way to make a more lived in and homey space. Martha O’Hara Interiors created a comfy space above. Even though it’s considered an industrial design the soft furnishings and accessories make this room lived in and inviting. The rug adds warmth to the wooden floor yet provides texture and interest. The brick wall in this room is a hardscape yet the introduction of potted plants, flowers and foliage lets nature in. And bringing nature indoors is nurturing to the soul. Stacked books on the coffee table is a creative way to bring an intellectual mood to this living room space. I also love the idea of using a large sunburst pillow as a cushion on this Danish wire chair. A great look – plus it draws you in to sit and rest your feet on the furry ottoman. Eclectic rooms do tend to look and feel much cozier than modern designed rooms. It doesn’t mean you have to throw everything in your living space but the kitchen sink. Too much clutter is simply…too much. Remember you still need to put together an eclectic space with some thought process when it comes to lay out. Remember vintage and worn finishes. Stay away from sterile and perfectly new items. Add throw pillows and rugs that complement each other and “go” together but don’t necessarily match each other. Pick a palette from an inspiring painting or a special ceramic vase. As you build these pieces in a room, begin to think about collections of items such as books, old record collections and stacked textiles. Photos add a personal touch as well, which definitely bring the homeyness vibe. Don’t forget about your pets! Nothing says home sweet home than a sweet dog or kitty to greet you at the door. Our pets are life breathing animals that make us smile after a long day. Create a homey environment for your pet by adding pet beds and areas that your pup or kitten can play. And if you don’t like furry pets, get some goldfish! 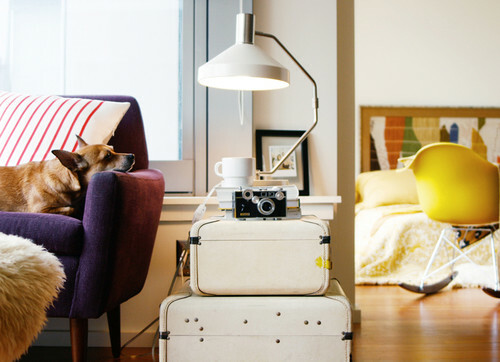 To me your home can be pet friendly and still be super stylish. Yes, and the same goes for those of us with kids! We have to think about our home as more than just decor to look at but a place for us, our family and our friends to love, live and rest.